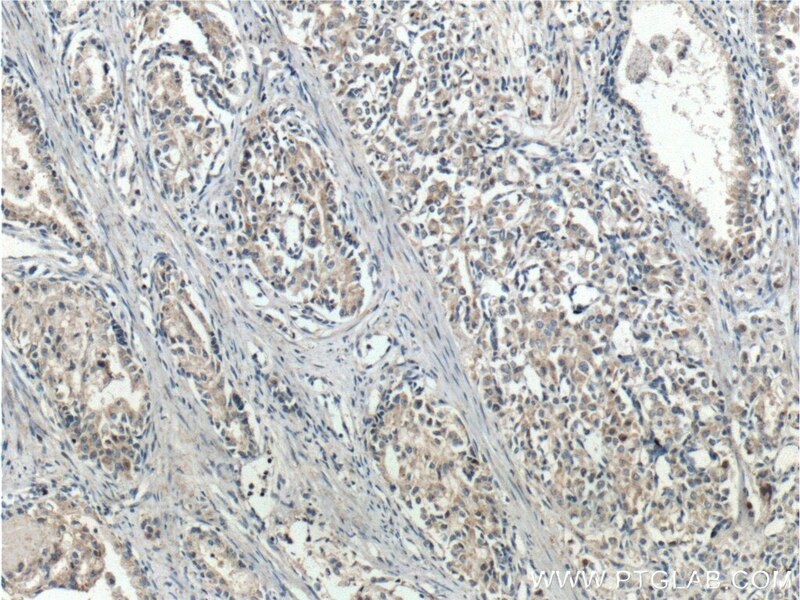 Immunohistochemical analysis of paraffin-embedded human prostate cancer tissue slide using 22034-1-AP( PTEN Antibody) at dilution of 1:200 (under 10x lens). heat mediated antigen retrieved with Tris-EDTA buffer(pH9). 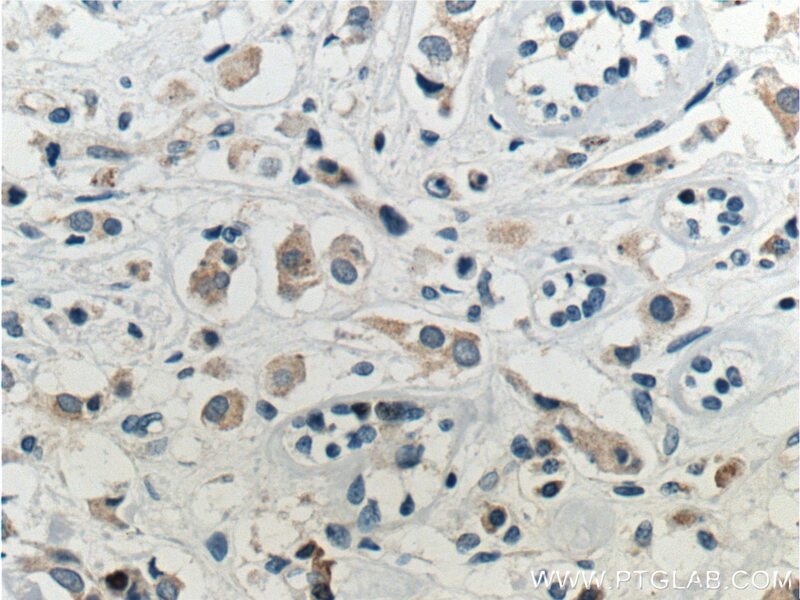 Immunohistochemical analysis of paraffin-embedded human prostate cancer tissue slide using 22034-1-AP( PTEN Antibody) at dilution of 1:200 (under 40x lens). heat mediated antigen retrieved with Tris-EDTA buffer(pH9). 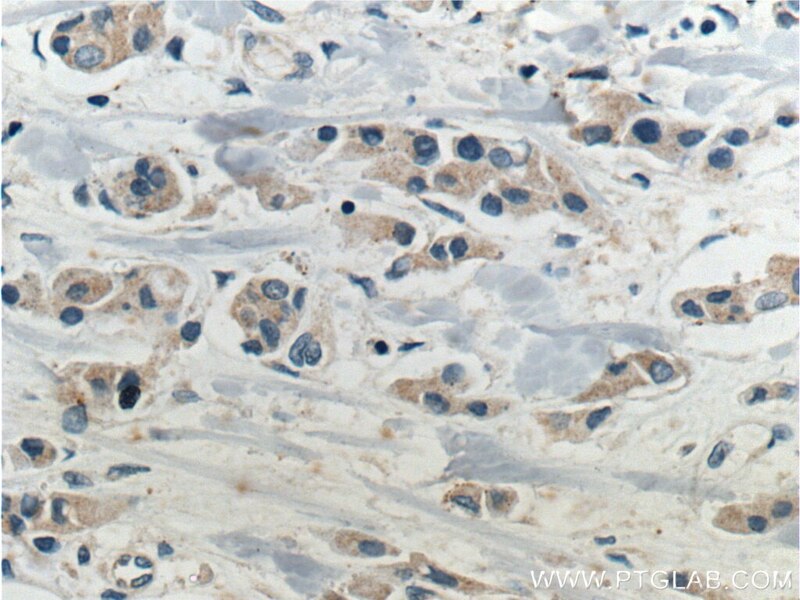 Phosphatase and tensin homolog (PTEN) is an enzyme key in cell cycle regulation and in tumor suppression. 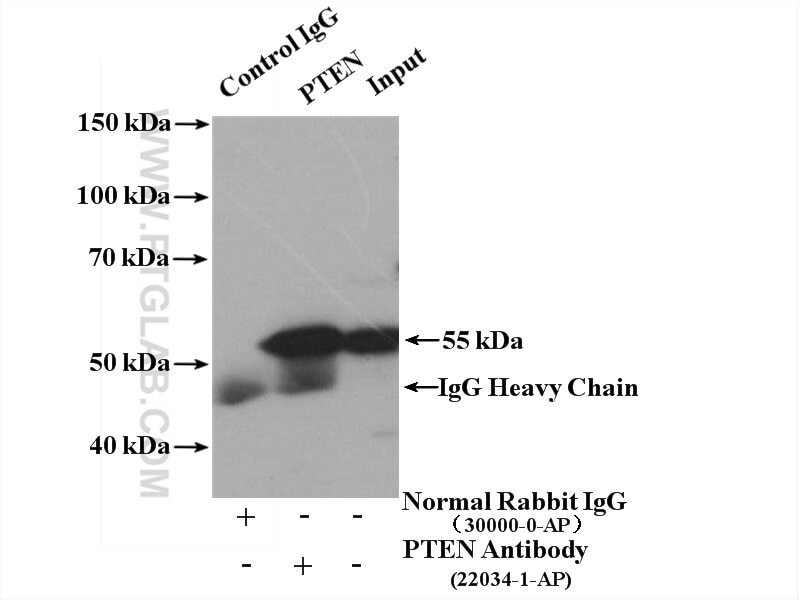 What is the molecular weight of PTEN? two isoforms with MWs of 55kDa and 68 kDa. What is the function of PTEN? 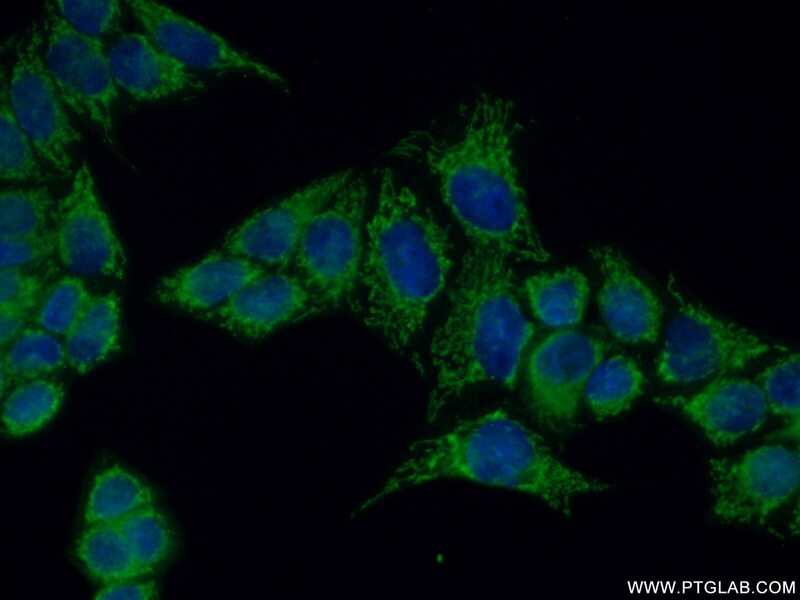 What is the role of PTEN in cancer? 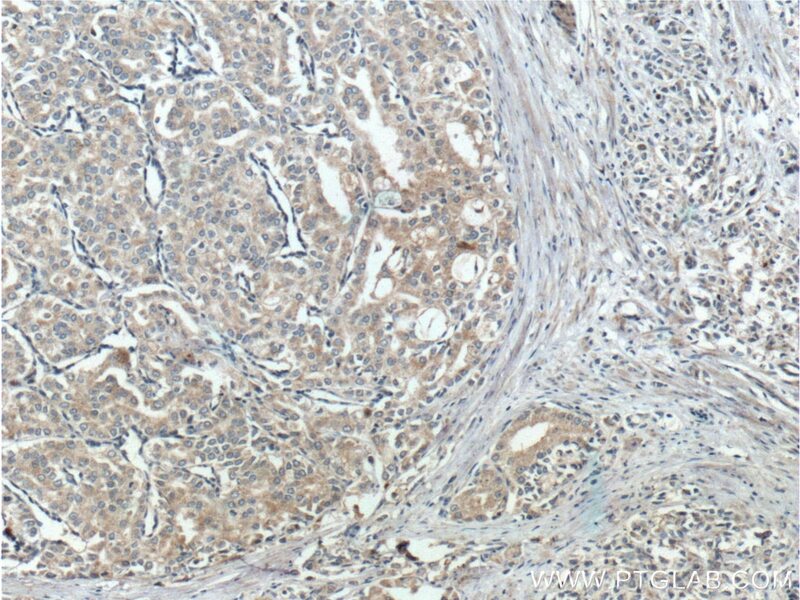 an increased risk of developing tumors, both benign and malignant (PMID: 26564076). 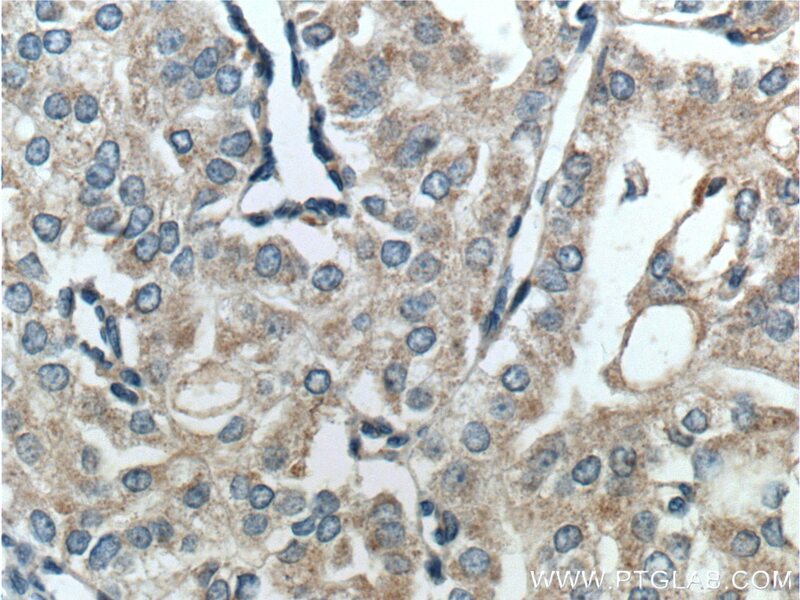 MicroRNA-130b targets PTEN to mediate drug resistance and proliferation of breast cancer cells via the PI3K/Akt signaling pathway. 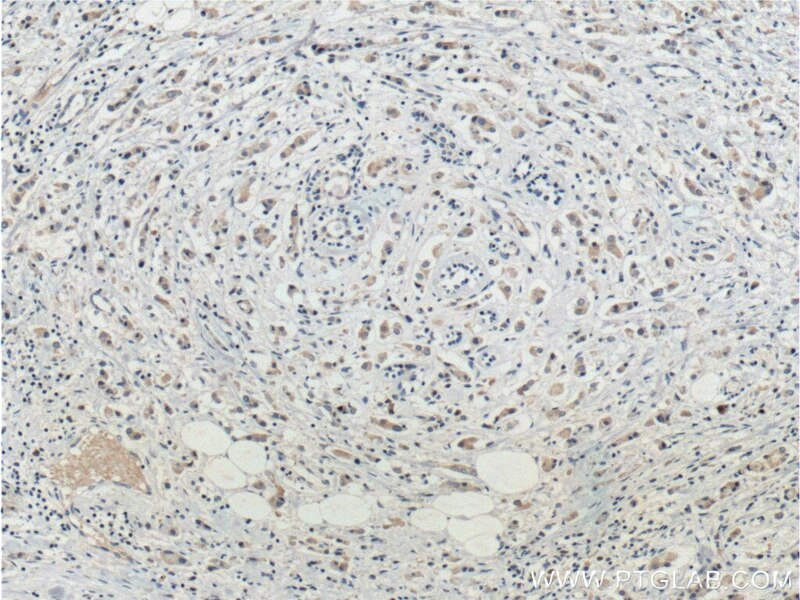 MiR-106b and miR-93 regulate cell progression by suppression of PTEN via PI3K/Akt pathway in breast cancer. Regulation of ERK and AKT pathways by hepatitis B virus X protein via the Notch1 pathway in hepatocellular carcinoma. Stearoyl-CoA desaturase-1 promotes colorectal cancer metastasis in response to glucose by suppressing PTEN. LASP1 promotes nasopharyngeal carcinoma progression through negatively regulation of the tumor suppressor PTEN. miR-217 Promotes Cardiac Hypertrophy and Dysfunction by Targeting PTEN. 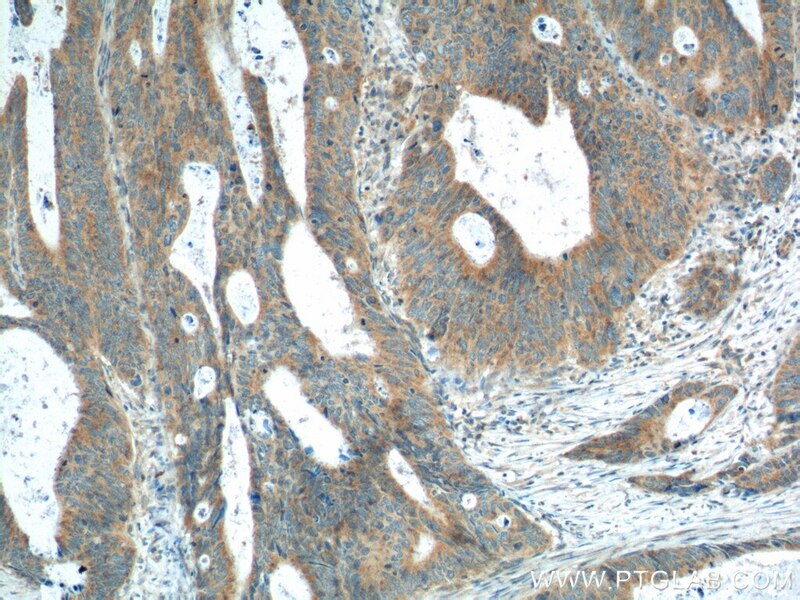 Immunohistochemical analysis of paraffin-embedded human breast cancer tissue slide using 22034-1-AP( PTEN Antibody) at dilution of 1:200 (under 10x lens). heat mediated antigen retrieved with Tris-EDTA buffer(pH9). 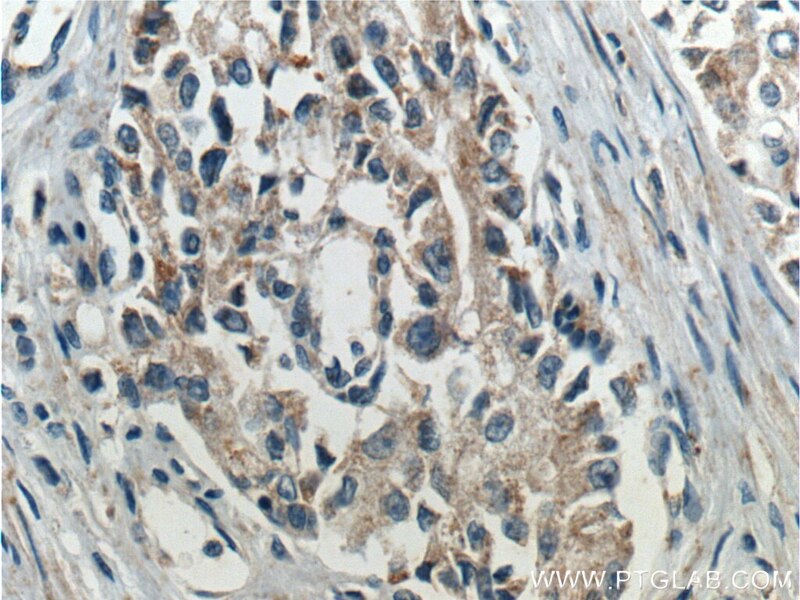 Immunohistochemical analysis of paraffin-embedded human breast cancer tissue slide using 22034-1-AP( PTEN Antibody) at dilution of 1:200 (under 40x lens). heat mediated antigen retrieved with Tris-EDTA buffer(pH9). 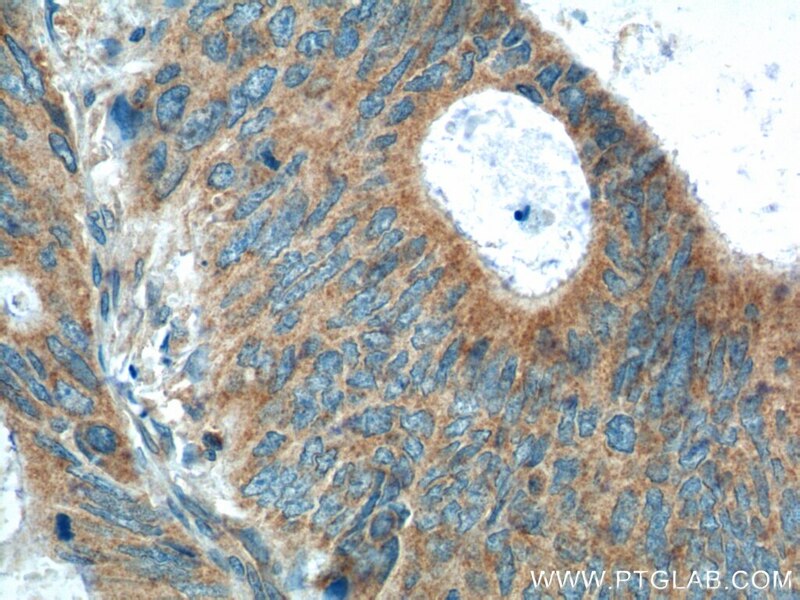 Immunohistochemical analysis of paraffin-embedded human colon cancer tissue slide using 22034-1-AP( PTEN Antibody) at dilution of 1:200 (under 10x lens). 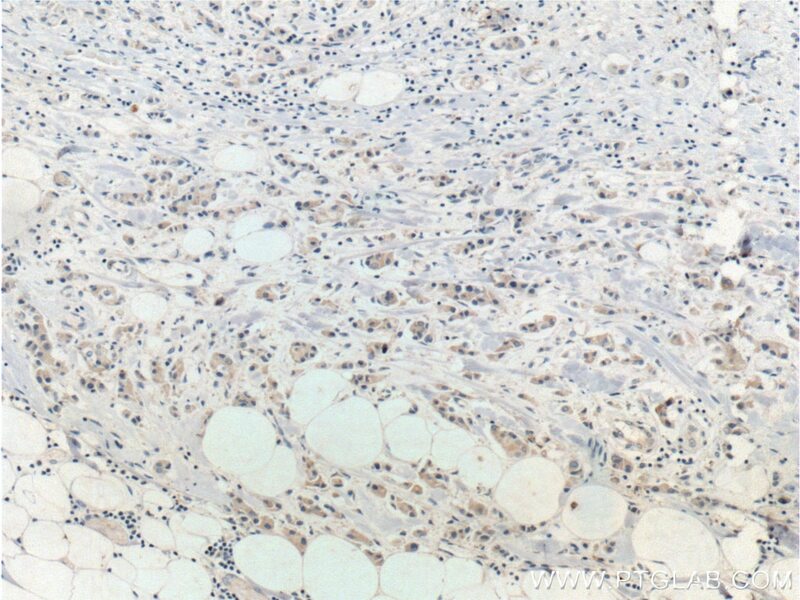 Immunohistochemical analysis of paraffin-embedded human colon cancer tissue slide using 22034-1-AP( PTEN Antibody) at dilution of 1:200 (under 40x lens). 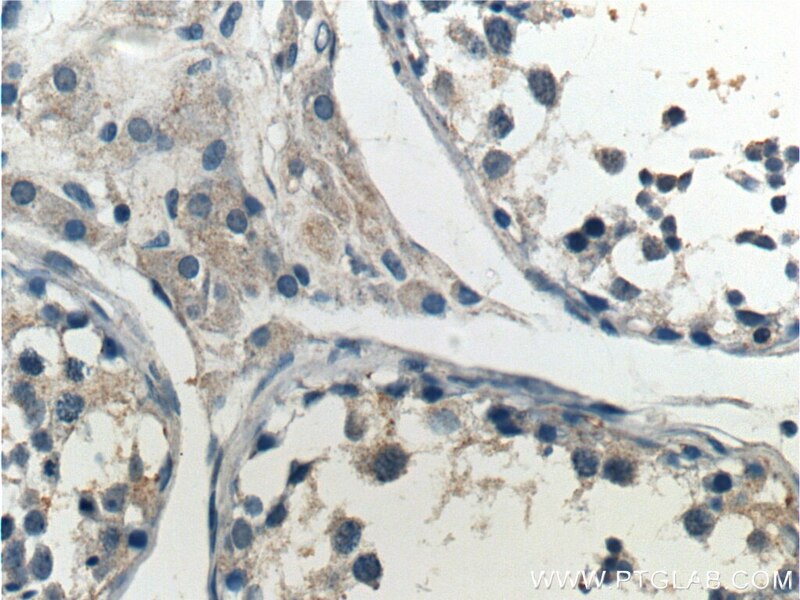 Immunohistochemical analysis of paraffin-embedded human testis tissue slide using 22034-1-AP( PTEN Antibody) at dilution of 1:200 (under 10x lens). 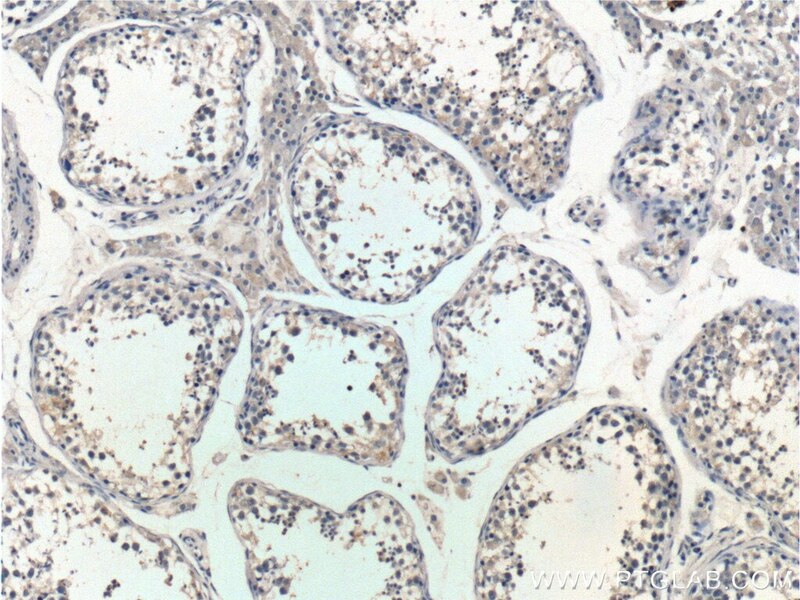 Immunohistochemical analysis of paraffin-embedded human testis tissue slide using 22034-1-AP( PTEN Antibody) at dilution of 1:200 (under 40x lens). 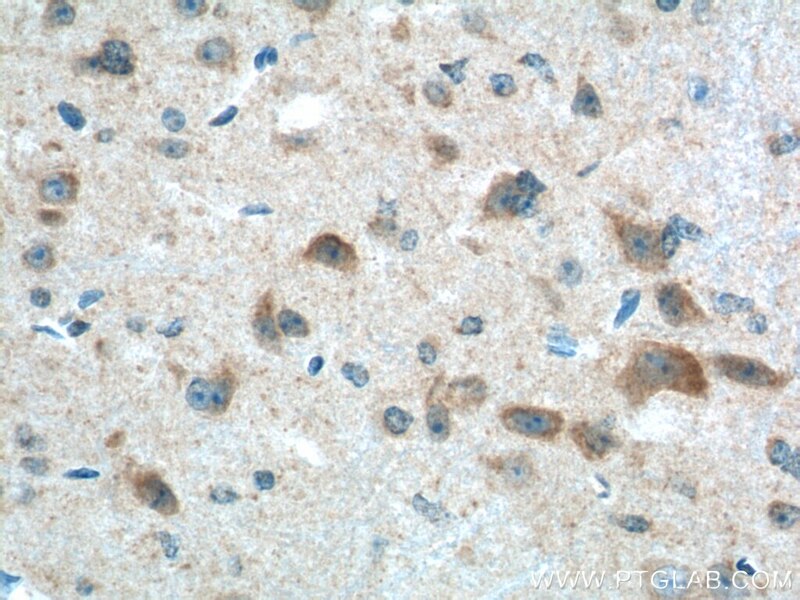 Immunohistochemical analysis of paraffin-embedded mouse brain tissue slide using 22034-1-AP( PTEN Antibody) at dilution of 1:200 (under 10x lens). 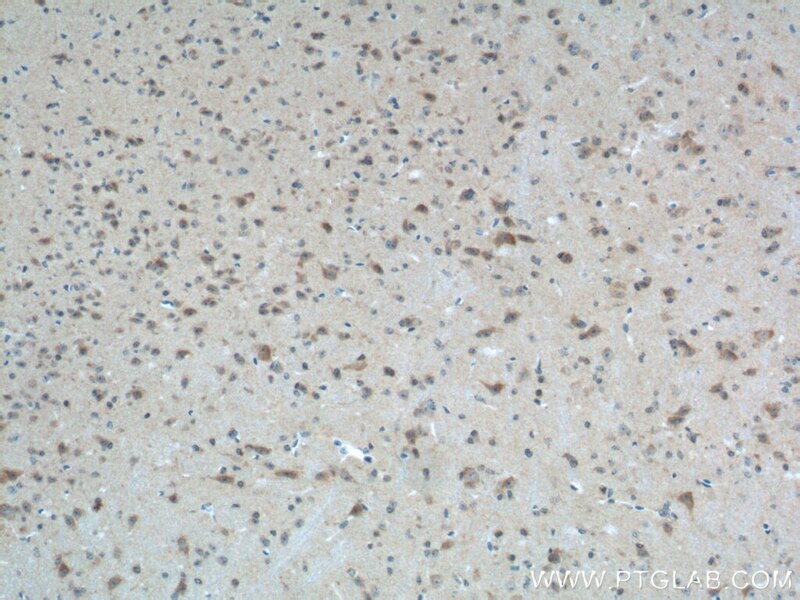 Immunohistochemical analysis of paraffin-embedded mouse brain tissue slide using 22034-1-AP( PTEN Antibody) at dilution of 1:200 (under 40x lens).